Custom umbrella shape tape measure keychain easily shelters you from the furious showers of competition hanging over the head. Makes a preferable gifting choice for all those who are trying to win attention from being unique. 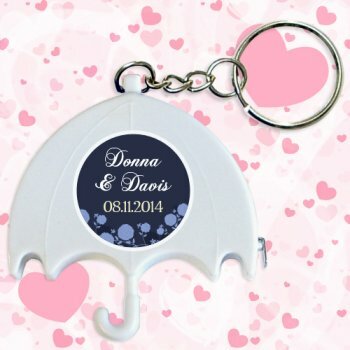 This umbrella shape tape measure keychain easily grabs eyeballs with its typical shape and people may come closer to notice your brand information. It easily transforms into a mighty tape measure and key hanger. It can be managed within bags, purses or pockets or managed over belt loops or hooks. Request a quote to know attractive price savings that we offer on bulk orders of custom umbrella shape tape measure keychain. Features – Umbrella shape tape measure with level and key chain. Solid ABS construction with 39" metal tape measure. Large imprint area. Product Size – 2" x 2”. Product color - Green, Black, Blue, Yellow, Red, and White.